Quickly steam milk for your smooth and creamy lattes and cappuccinos with this Choice 20 oz. stainless steel frothing pitcher! When using with your cappuccino or espresso machine, partially submerging the steam wand into this pitcher filled with cold milk to create your microfoam. Then fully submerging the wand once the foam is added to finish bringing the milk up to its desired serving temperature. The created foam will be perfect for finishing off a variety of delicious and profitable hot beverages! Plus, the angled handle promotes an easy grip for complete control during use while the smooth-rimmed spout promotes accurate, precise pouring. This frothing pitcher is also great for training baristas to create latte art atop your beverages to increase their perceived value; by simply moving the pitcher in various motions while pouring the foam, you can create a multitude of designs like hearts, leaves, or flowers. As a barista, I use this guy at home for my personal espresso setup. It lets you make a good spiral and pours well for art. I’ve had one or two people drop it when examining (thankfully empty) and it’s built tough. I can easily suggest this for business use. Sturdy product, seems to be made of good quality stainless steel. However, we've used and sell a different brand before at the same cost but at a much higher quality. The one we used to sell is made with a thicker metal and sturdier. This pitcher has a handle without much of an angle, so you can better keep your knuckles from touching while steaming. It’s much easier to hold compared to the pitchers with handles that slope down towards the bottom. Sturdy frothing pitcher. This is one of the cheapest I found but the quality doesn't lack. I will be ordering plenty more of these in the future. Nice little frothing pitcher, we use it with our espresso machine to froth milk and it is the perfect size for us. We've used and washed it many times and it is still shiny and nice like the day we got it! Very sturdy. perfect. excellent. does everything i need it to. it makes milk frothy. my baristas are super happy. when it gets cold again I'm going to get a few more. We use these in our café to make hot chocolate and various coffee drinks, easy to use without scalding yourself and very easy to clean! Works well to froth milk. It's the correct measure for a 20 ounce drink as well. This is my go-to pitcher for 12 ounce when I need the froth to grow a bit as well. Really good one i think its the perfect size to froth milk for capuccinos works really great the shape and the stainless steel construction is amazing!! This pitcher is very well made. The material is thick and sturdy and the size is perfect for making our 16 and 20 oz lattes. The handle is comfortable to hold in your hand. Very well made with high quality, food grade stainless steel. The spout makes for very easy pouring, and allows for a smaller margin for spills. We use these pitcher at our cofgee and tea shop for frothing milk for 16 oz cups of espresso drinks. It is the perfect size to allow the milk to stretch. This frothing pitcher is great for foaming up milk for lattes or cappuccinos. It is made of stainless steel which is easy to clean and prevents any rusting. A great sized pitcher for steaming larger amounts of milk. We can usually steam enough for 2 16oz drinks at one time, which makes our jobs much easier! We have 3 of these pitchers in the shop and could not be happier! They're the perfect size to make 8, 12 and 16oz cappuccinos and lattes. Great Product! Our clients are extremely happy with this Frothing Pitcher. It is affordable and well made. We are purchasing more units of it every month. Highly recommend it!!! This is a fantastic frothing pitcher! The handle does not get hot during frothing. it pours beautifully. This poor pitcher has been dropped multiple times yet does not have a single dent. This pitcher is great for frothing milk for 2 or 3 lattes at a time. Its a great time saver for the barista when they have a heavy steamed milk order come in. Easy to bang out 2/3 drinks at a time with this pitcher. Again easy to clean. Essential for a barista station. Very durable and easy to clean. Use multiple ways throughout our kitchen. Great size for 16 ounce drinks. Definitely glad that I purchased a few more than I needed. This is a great pitcher to steam milk with for lattes. It keeps the milk hot while you're waiting on your espresso. I love it. This 20 oz frothing pitcher is the perfect size to steam milk for a 16 oz latte. The pitcher is durable and easy to clean up. 20 oz pitchers is quite large. Like having it around for when we get a double latte or mocha order in, but mostly this takes up space in our shop. We purchased two and dedicated one just for holding hot sleeves, thermometers etc. Really not an appropriate size unless doing multiple high-volume drinks. The pitcher itself is sturdy and well made, just not what we needed in the end. This product is amazing, we use it everyday! We love this product and regularly use this because it holds lots or milk and drinks that we steam. This 20 oz. Frothing Pitcher is a great value for something that is a staple in any coffee shop and essential for every barista. Perfect size for steaming our 16 oz drinks. Great frothing pitcher! We use it all the time at our coffee shop and we never seem to have a problem. Decent price, too! Don't hesitate to buy this! Nice quality frothing pitcher. It is the perfect size when making one drink. I have a couple of different pitchers but I use this one most often. I use these pitchers for making my handmade products, I love stainless stee and love the prices they are offered here for. I only use stainless steel utensils for my projects. A solidly built frothing pitcher. Enough room to steam a good amount of milk, and then clean up is a breeze after you are done using it. The 20oz pitcher is much smaller than I expected. I ordered the 20oz and the 33oz, for the sake of comparison. I have used the 33oz exclusively. Can't be more happy about that pitcher. I bought 2 for my coffee station but after months of use, i found new way to use it on a daily basis for more than coffee. I kept one for coffee but use my spare for sauce, dressing, service. Perfect size, can even use it as mixing pot for small quantity of sauce straight in it with my stick blender. I'll get more of them soon for add to my business as color and cream mixing pot. Price is amazing and quality is made for last for years! Pretty smart expense in my opinion. I love this pitcher! I upgraded from a 12 oz pitcher to this one and it works so much better for all if my frothing needs! I couldn't be more pleased! I ordered 10 or so of these for my new coffee shop and they look great and seem super sturdy. A great value for the price. Sturdy construction yet lightweight that is easier to handle when frothing milk for espresso. The handle stays cool to the touch when steaming milk. The notched lip makes pouring steamed milk easier. Will definitely consider buying other sizes for extra pitchers. These are built to last! These pitchers are little tanks, I used everyday and they hold up great. Wash up easy and stay nice and shinny! I have the 12oz and 20oz but like the 20oz the best, lots of room for making 20oz drinks. 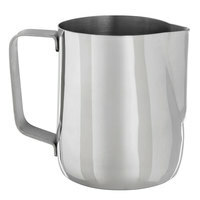 This pitcher works well for frothing milk for cappuccinos or lattes up to 12oz. It is very well made, beautiful stainless steal, not some cheap material that just looks like stainless steal. Very happy with the purchase. This frothing pitcher is great. The quality is good and it has held up under intense use. The handle is sturdy and doesn't get too hot. Great buy! No issues. I think this is a good value. It's a standard design and serves its purpose. In a coffee shop it's good to have multiple units in the refrigerator ready to use. I'm not sure why I expected these to be a little larger than they were, but I ended up ordering a couple larger ones as well. These do work great for our small size lattes and chai drinks though, and are easy to manage and pour. Happy with the purchase as some frothing pitchers are heavy, clunky or don't pour well. These are solid but light weight. I like this Update Intl. 20 oz. frothing pitcher so much that I ordered a second one! This little stainless steel pitcher is the perfect size for steaming & frothing milk with my espresso maker... and it really is stainless steel - no rusting here. Also, WEBstaurant sells them at about half the price of other 'Prime' online retailers. Great price and quality product. Perfect for frothing milk for 12 oz. or smaller latte or cappuccino. Wished the pitcher had some measuring lines inside, but not a deal breaker. Good frothing pitcher for the price I pay. It's a good quality pitcher with shiny surface. The only downside is that when I use syrup, it stains the pitcher. I tried washing it but I could not get rid of it. I probably have to dip it in a chlorox water.